The following, ever so slightly edited, email exchange took place a couple of weeks ago. Names have been changed to protect the innocent (and guilty) and I have asked Ms Moneypenny's permission for re-print rights. Much MUCH better with out too much writing going down the side but sensible side-links instead. That last post was good too! God, I am at my desk and I can hear Gavin talking. He is about 30 (? no idea actually) and looks like boy-band material but God is he a dickhead! He talks too loud on the phone and he annoys the hell out of me! Bought myself two pairs of jeans at lunch today. It was our 8 year anniversary yesterday and we both forgot. It was my mum who told us!!!!! Anyway what was I about to say? Oh yeah, we both forgot our last three & considering its on St Patrick’s day well, were just rubbish too. Think I might have to blog about the dangers of trying heat-up diet dinners before you're due to attend Parent Teacher interviews. Had my legs furiously crossed for the final five minutes. Ok going to read Mrs Woog [Woogsworld] for further cheering-up, since I'll be stuck in the small room for a while yet. I just want to sigh inwardly and think what a prat Gavin is. He wouldn't turn it down to a dull roar if I asked him anyway. I did ask the guy who sits next to me (who I don't like much either) if he would talk more quietly because he shouts and he said it is just how he talks. So that is why I don't like him much either. That was about 2 years ago. I do have a desk by the window though and I have a bookshelf and a plant which is mine and so it is very nice. I enjoy listening to Gavin and hating him anyway. About a year ago I heard him ring up a woman (I think in Taiwan where our factory is) and try to chat her up and ask her out and it was so cringeable I loved it. She didn't want anything to do with him. I was doing laps of the car-park earlier trying to let off, before I had to go inside and make like a nice normal responsible parent type. I still spent the last five minutes of my PT interview with my legs crossed tight, (& u just try that on kids furniture) and probably a look on my face a little more earnest than was called for by the discussion. Of course the pressure built up & I was almost jet-propelled to my car. I am a disgusting bloated fart-factory. 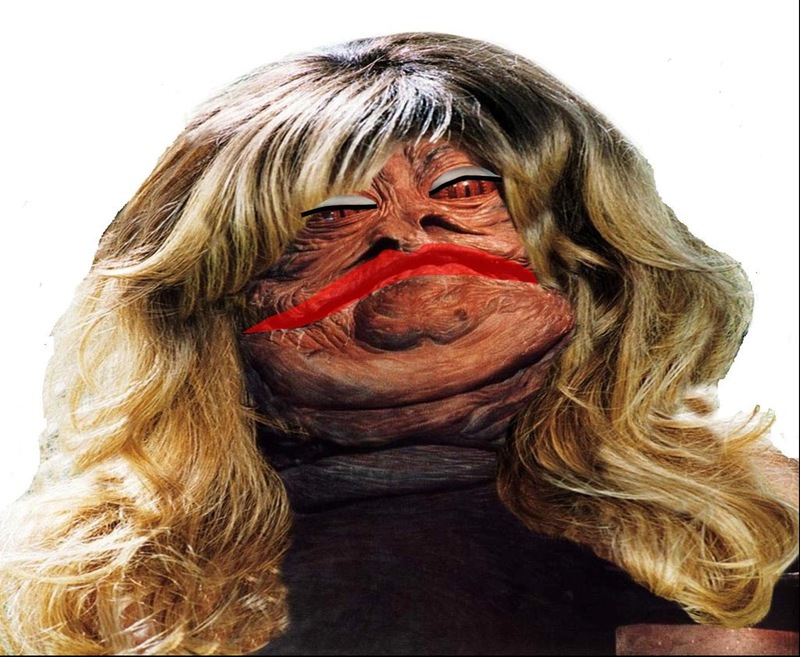 I am Jaba the hut with lipstick. Just now Mr Rugrat’s gagging made me laugh & I lost what little control I was clinging to and this time even the dog left the room. There has been a request that I sleep in the guest room tonight. Ok TMI now. Goodnight and good luck!